40049 RA6158.jpg 500X638\RA6158.jpg 32636 RA6158_2.jpg 500X638\RA6158_2.jpg Send A Hint! 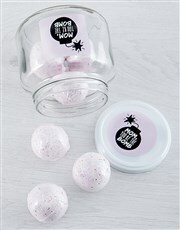 Product Description: less text If your mom loves nothing more than a nice hot bath, then she will just love these bath bombs which come presented in a glass jar with unique 'Mom you're the bomb' label design. This is the perfect Mother's Day gift, so be sure to send! 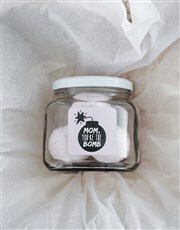 Get this Mom Youre The Bomb Gift Set delivered with NetFlorist.